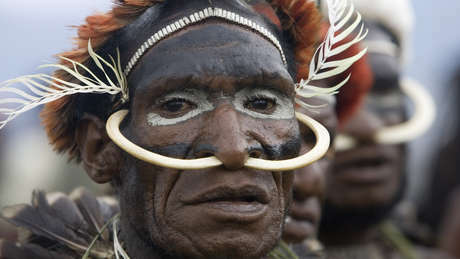 A Korowai woman in West Papua, occupied by Indonesia since 1963. The Indonesian military and para-military police (BRIMOB) have launched a violent operation against Papuan tribal people in the Punkak Jaya region in the central highlands of West Papua. The notorious BRIMOB and Indonesian soldiers are conducting a sweeping operation against members of the Free Papua Movement (OPM) who are fighting for independence from Indonesia. However, reports indicate that the operation is following a familiar pattern of targeting innocent civilian tribespeople, causing thousands to flee their villages and hide in the forests. Survival is calling on the Indonesian government to allow humanitarian assistance and independent observers into the region. In May, the security forces warned that a major operation would be launched in the region if OPM leader Goliat Tabuni did not surrender by June 28. However, reports clearly show that the operation has already been underway for some time. Survival is concerned that the violence may escalate even further in the coming weeks. During similar military operations in the past, soldiers and police have killed Papuan villagers, raped women and children as young as three and destroyed the tribes’ homes, churches, vegetable gardens and pigs. Those fleeing to the forests have often faced starvation, as they have been too scared to venture out to hunt or to collect food. Detailed information is scarce due to travel restrictions and a ban on journalists and human rights organizations in the region. However, news has emerged that a pregnant woman was raped by BRIMOB personnel in early June in the village of Kampong Tinggineri, and that 12 houses and two churches have been burned by soldiers in Gwenggu Pilla. BRIMOB has conducted sweeping searches of houses, detaining anyone without identification, which few people have in this remote area.